It was certainly another night to remember. Princess Grace had another very special Volley for Grace night this week. Several weeks ago, Hillsboro High School volleyball coach Emily Zimmerman contacted Kyle. 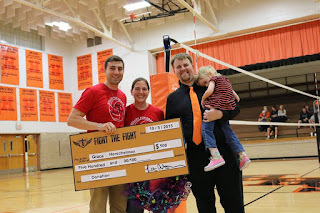 She said she had been inspired by the Volley for Grace night in Morrisonville, held at the beginning of September, and wanted to host a similar event at HHS. We were honored for another chance to share our story and raise more awareness for INAD. Even better, the Lady Hiltoppers were hosting the Lady Lancers (who are working on their own fundraiser for Grace). It's a bonus for us because two of Kyle's cousins are freshmen on the Lincolnwood team, and we get to see them play too. It also worked out pretty well that like Lincolnwood, Hillsboro's colors are orange and black, and it was fun to see more of the Amazing Grace Fight the Fight shirts. Grandpa Randy got to hang out with cousin Quincy during the game. When we first walked into the gym lobby, there was a huge table full of delicious sweets as part of a bake sale for Grace. 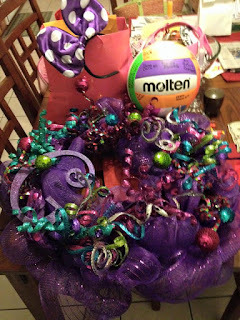 They also had a silent auction for two orange and black wreaths. We continue to be humbled by people's generosity toward Grace. She's definitely more popular than Kyle and I put together. In fact, she had quite the cheering section Monday night. 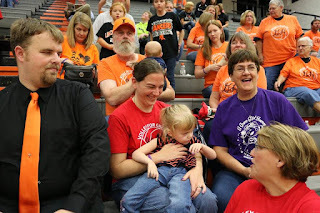 In addition to both sets of grandparents, Kyle's sister Mikaela brought our nephew Quincy, Kyle's aunt Angie and Katelyn, and my Aunt Anne, Uncle Ralph, Phil and Izzy. And there was a very nice crowd for the volleyball game as well. 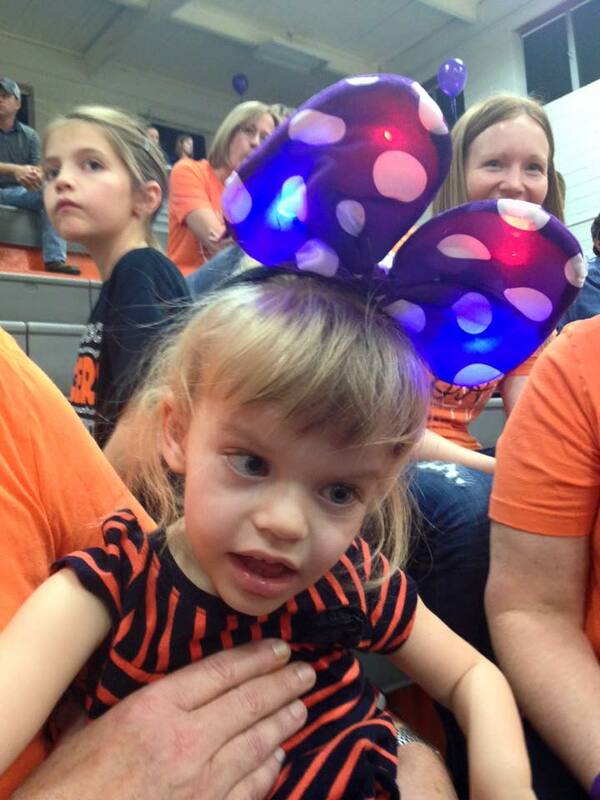 Grace seems to have quite a cheering section wherever she goes, and she loves every minute! Although we didn't arrive right at the beginning, we did get there in time to see some of the junior varsity action and watch Kayley and Kensey play. Then, they held a Serving for Grace contest. Players from both teams sat on either side of the court. Participants could pay $1 to serve the ball, and if it hit one of the players, then they won a prize. It was fun to watch, although I didn't try to serve myself. I figured I would have embarrassed Grace. 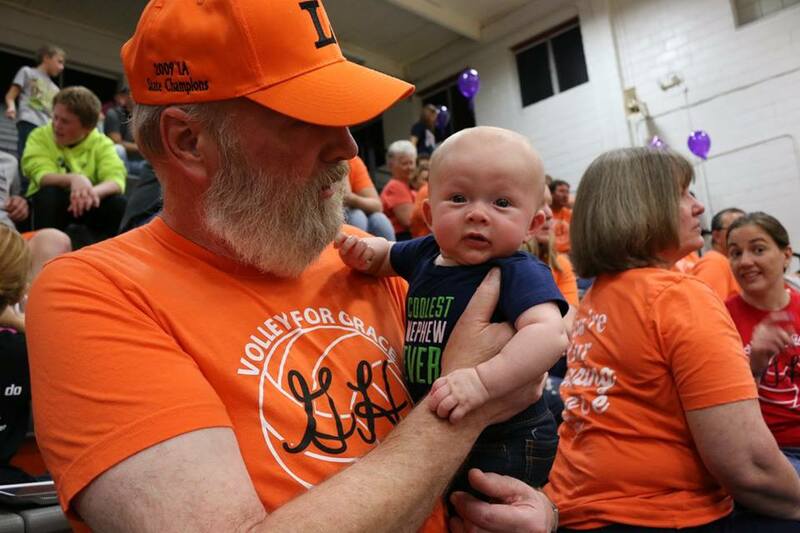 I love this photo where you can read the back of the Volley for Grace shirts. 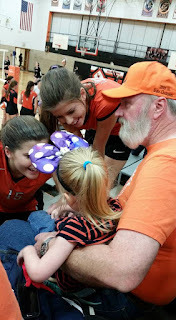 After the junior varsity match was over, Coach Emily asked us to come down to the floor. 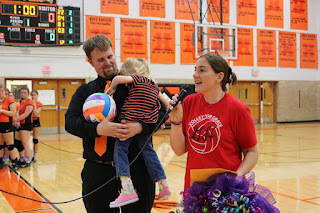 She presented us with several donations, including money from the serving contest as well as jeans days from both Hillsboro High School and Bunker Hill High School, totaling over $300. 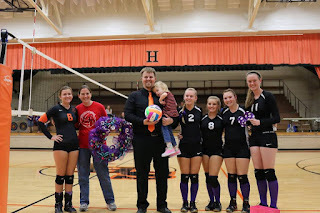 Some players from both teams had presents for Grace, including a brightly colored volleyball signed by all the players and coaches. 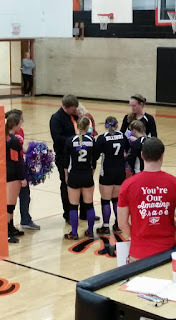 Then, players from both teams had gifts for Grace. Lincolnwood gave her a beautiful mesh purple wreath to hang in our home, and Hillsboro gave her several new pairs of tall socks and flashing purple Minnie Mouse ears. She already wore a pair of her new Minnie Mouse socks to preschool today. She also got a pair of tall purple socks to match that of the players, who wore tall socks just for Grace that night. 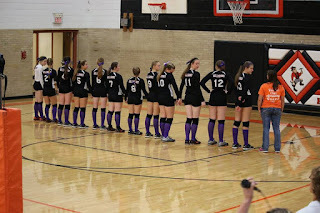 And players from both teams wore purple socks in her honor. Check out these tall purple socks in honor of Grace! We were also very excited for the chance to see Pete Visintin again from Fight the Fight, who had yet another check presentation for us. Since Grace's donation period wasn't quite over by the last Volley for Grace game, he told us he had some more money for us, $500, in fact. And it gave Pete another chance to talk about how awesome Fight the Fight is. We have been truly impressed by the organization he created and how it benefits local families. Pete Visintin gave us another big check from Fight the Fight. And after Pete was done, it was my turn to say thanks. Kyle now just refers to me as the family spokesperson, I guess because I like to talk so much. I don't ever really feel like I have any words of wisdom, but I did enjoy having the chance to thank everyone for being part of our Grace-filled journey. As we returned to our seats, the crowd gave us a standing ovation, which is still pretty overwhelming for us. My "gift of gab" makes me the family spokesperson. Then it was time for the varsity game to start. Unfortunately, Grace had skipped her nap on Monday afternoon, so she was getting pretty tired by the time that game started. She and I left early to go home and get a bath. But Kyle was able to stay until the end of the game and give our thanks to everyone who participated. Hanging out with Kayley and Kensey between games. As he got ready to leave, Missy Reynolds gave him the donation bucket from the bake sale, which ended up having over $500 in it. All total, the teams raised over $1,300 that night which will be donated to the INAD research study at Washington University. They are doing great things there, so we know the money will be put to good use. 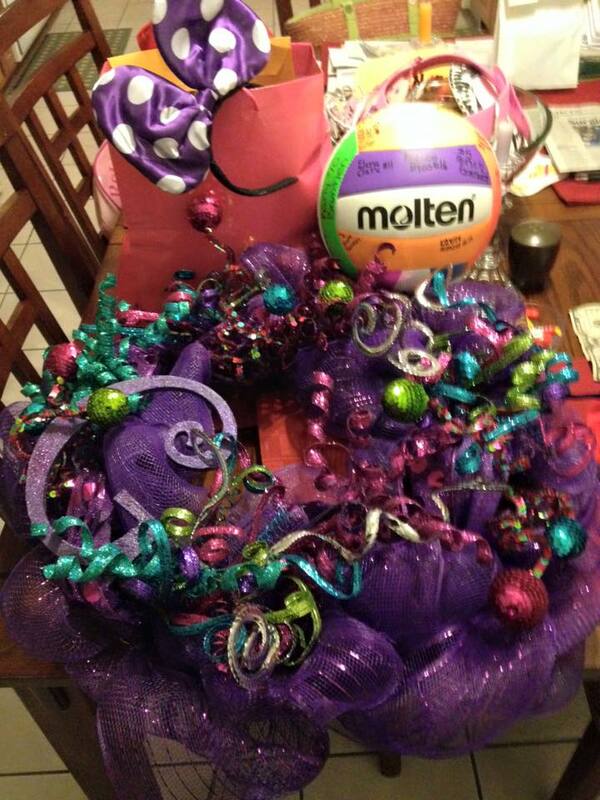 These are Grace's gifts from the volleyball players. It was such an amazing night to share with Grace, our families and our communities, who continue to make us feel so loved each and every day.